My brief forays into solo role-playing have fallen dormant. Work, family, "normal" games, and just life in general has a way of making that happen. However, I do really enjoy it and am looking forward to busting out the Mythic GM Emulator again! I still really like what Mythic did with their Emulator. There are plenty of other systems out there, and I was looking into them for my next game. Since the release of the second season of Daredevil, I've been wanting to bust out a superhero game. I ran something like one a few years ago, but my actual experience playing supers is pretty limited. I poked around at various systems, some standard, others solo focused. 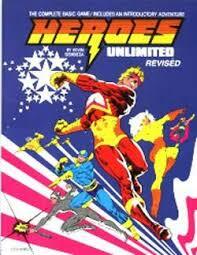 None of them hit exactly what I wanted, so I'm going with my old standby, Palladium's Heroes Unlimited. There's a lot of negativity about Palladium's system, but it hits the sweet spot for me. Or, maybe it's just because I've owned the books for so long and never really got to play with them. In any case, I'm going with HU2 and the Mythic. I spent probably too much time rolling up various random characters, but none of them clicked for me. When I did Andrei for Vampire, I had the advantage of using the Players Kit to generate a pretty solid background that gave the game a lot of focus and drive. I tried using Central Casting Heroes NOW! for inspiration, but it just didn't work for me. Though, I would really love to see an updated take on the "generic random background generator" idea. So, part of it is the generators, but part of is the "blank page problem." I talked about before how, when you're running a Solo game, the world and setting are as important, if not more important, as when one is running a standard game. And right now, I have nothing. Vampire, at least, had an implied setting, and Chicago by Night filled in for the rest. HU2 has something of an implied setting, but nothing as neatly detailed as Vampire or a superhero game based on Marvel or DC. But, coming up with a setting is a pretty big job, and I kind of want to get playing. Fortunately, back when I was running Heroes Hunter I came up with a couple of random tables for quickly generating locations for my team of villains to commit shenanigans, and I see no reason to let that work go to waste! I decide to go with "Crescent City," a generic home brew setting. It's a coastal town, around the actual Crescent City in California. But, other than that, it's entirely going to be made up. My idea for the city is that the super elements are hidden from the masses. Other cities in the world are like Metropolis or Gotham or New York, but here people assume there are no flying men or aliens. The city itself is mid-sized, around 500 thousand or so people. Law Rating: 2--sufficient for day to day situations. This fits my idea, the majority are both unaware of, and unprepared for the amazing. Factions: 3. There are three different groups of "supers" operating in this town. This is not counting the various individuals who operate independently. For now, they are dubbed A, B, and C.
Alright. So, team A are the heroes. 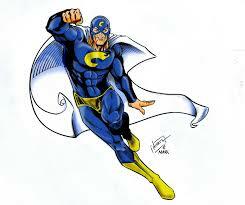 They're mundane--specialized training isn't inherently "super," which keeps the theme. They are engaged in something like a war against Group B, which have effectively co-opted the mundane government. I decide to call them "Liberators." Group B is known as a crime syndicate, probably the biggest and nastiest group in the city. They have bribed and corrupted most of the institutions of the city, but are still careful to avoid anything obvious. The fact that they are all, or mostly, psychics greatly aids in this. As a crime syndicate, they are known on the streets as "The Firm." They seek the next advancement in human capability, and use their criminal activities to fund illegal scientific experiments, and enslaving those that succeed. Group C is the most subtle of the groups, They consist of a small force of Aliens who seek to establish dominance over the world. Their front is "The Universal Brotherhood," a Christian/New Age movement that is rapidly spreading across North America, with small congregations in Europe and missionaries elsewhere. Most members are decent people, unknowingly serving their dark masters. I now have a pretty decent idea of how the city is operating. Experiments, mutants, bionics, and, naturally, psionics can be the result of the Firm's activities. Aliens could be rogue members of the Brotherhood, or even noble aliens opposed to the vile group. Any hero category can team up with the Liberators. I fortunately already have created various generic character types (thugs and the like) for Palladium. Now, I want to stat up the Group's per the Villains Unlimited Organization rules, and make a few key NPC's for each Group. Then, I'll be ready to make my character, and we can see where the game takes us!